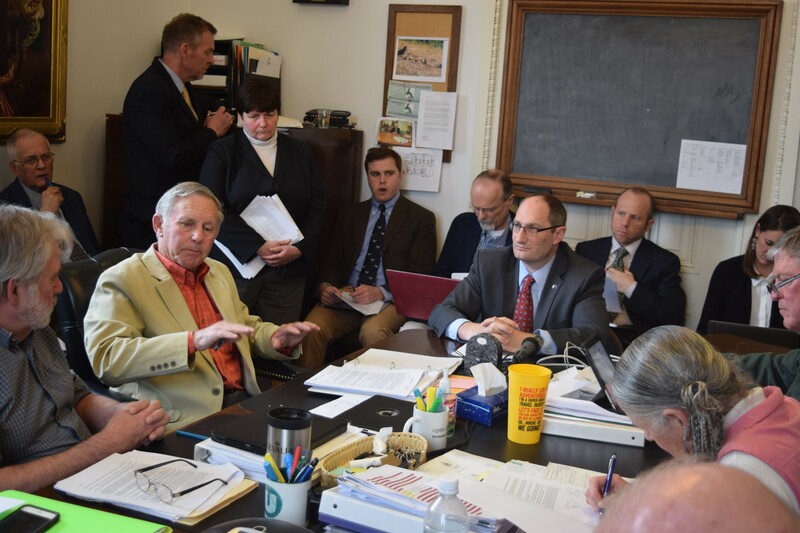 Sen. Bobby Starr (D-Essex/Orleans) discusses a proposed state employee retirement incentive with Administration Secretary Justin Johnson on Monday. Vermont appears ready to dangle up to $15,000 in front of retirement-eligible state workers in hopes of saving $2.5 million in salaries and benefits next year. According to the retirement-incentive plan laid out Monday by Administration Secretary Justin Johnson, the state would allow up to 300 state workers to take the bait. He told the Senate Appropriations Committee that the state has 915 employees who are eligible to retire but have chosen to keep working. The incentive would be based on the number of years worked, and would be capped at $15,000, Johnson said. The Senate Appropriations Committee is expected to include the plan in a budget bill the panel is likely to pass Tuesday. The retirement incentive is on a menu of items intended to save $10.8 million in personnel costs as the state addresses a $113 million budget gap. By offering the incentive, Johnson said last week, the state should be able limit layoffs to fewer than 50. The plan depends on the state leaving three-quarters of the positions unfilled, Johnson said. He conceded that figuring out which vacancies to fill will be complicated because there's no way of knowing who will opt for the incentive. "It will create a management challenge," he said. In 2009, when the state offered the same incentive, 336 workers expressed interest and 243 workers took the option, he said. If more than 300 employees choose the incentive, they would be selected by lottery, Johnson said. The state would allow 200 of the workers to retire in October and another 100 to do so by March. Letting more people choose the incentive would mean a financial hit for the state employee retirement fund, he said.